Nadia Pandolfo is a lifestyle, portrait, beauty, and fashion photographer based in Los Angeles. First introduced to photography at the young age of ten, Nadia has a gift for making masterful compositions and connecting with people. She has traveled to and photographed in many countries around the world, including Cuba, Galapagos, Iceland, and Brazil. A talented visual storyteller, Nadia’s work has been widely published in the U.S. and around the world. This week Nadia speaks to atlas about her soulful trip to San Lucas Tolimán in Guatemala, what inspired her to travel to this village, the challenges she encountered while interacting with and photographing members of the Kaqchikel tribe, and what she took away from her experience. Nadia Pandolfo: I was introduced to photography as a child perhaps when I was eight years old. My mother was getting her master’s degree in Radio, Television and Film at Temple University. She was taking a photography class as part of that program and developing her own black and white film. My brothers and I were her favorite subjects. Around this time, my mother gave me a camera for Christmas. So I began experimenting on my cousins and friends. Later, I took a photography class at Harriton High School with the art teacher, Peter Murray, and I learned some technical skills. When I went off to California, I inherited my mother’s Fujica 35mm manual camera and continued taking classes first at UCSB and then at USC. What about photography do you love the most? I love to contemplate the distinction between light and darkness, and I love to try to capture short glimpses into the human soul during its journey on this earth. You have been shooting lifestyle, fashion, and portrait photography. Which do you enjoy photographing the most and why? It is difficult to say which I enjoy most. I enjoy all of these types of photography and that is because I love to work with people. I love the dynamism, emotion, and movement of lifestyle. I love the drama and artifice of fashion and the simplicity of the character study in portraiture. Can you tell us about these beautiful images from Guatemala? What inspired you to take photographs there? In 2014 I traveled to San Lucas Tolimán, Guatemala, a small village situated on the picturesque Lake Atitlán, to volunteer at the Centro Educativo Pavarotti. It is a middle school sponsored by Nobel Peace Prize winner, Rigoberta Menchú. The school was established in 2005 with funds generated by a concert given by Luciano Pavarotti. The mission of the school is to preserve indigenous culture and language in Guatemala. There are twenty-three different indigenous languages spoken and about fourteen different tribes in Guatemala. The village of San Lucas Tolimán is primarily inhabited by members of the Kaqchikel tribe. Guatemala has had a tumultuous history of civil war and genocide of the indigenous people. The children who attend this school are descendants of victims of this genocide. Besides the obvious loss of human life, there has also been a loss of indigenous language and culture as a result of the civil war in Guatemala. I was inspired by the local people of this village, by Rigoberta Menchú, Ozwaldo Gálvez, the headmaster of the school, Baldomero Martin Balam and his wife, Carmen Rosa Sajquiy Lopez, the main caretakers of the school, many of these children, especially Inez and Abby, and the teachers. It was a privilege to travel to Guatemala and to encounter these people so I could document a small part their endeavor to rebuild the self-esteem of the indigenous cultures of Guatemala. The main challenge was to open myself to the experience of the local people in the face of their suffering and my own foreigner’s perspective. I had to humble myself and establish their trust so that they would invite me into their world. I met a woman, Florinda Shipin Mejia, in the local market. She invited me into her home to teach me how she weaves fabric and introduced me to her five children. She confided her life struggles to me. Kaqchikel is her first language, but she could also speak elementary Spanish. She told me that whatever she sells at the market in a given day is the money she has to buy food for her children that same day. If she does not sell one day, she does not have money for food that day. She allowed me to interview her on video for a documentary. When I asked her if there was anything she would like to say to people in America, she said she wants to let them know that people like her exist, and that they do beautiful work making textiles and other handicraft items. 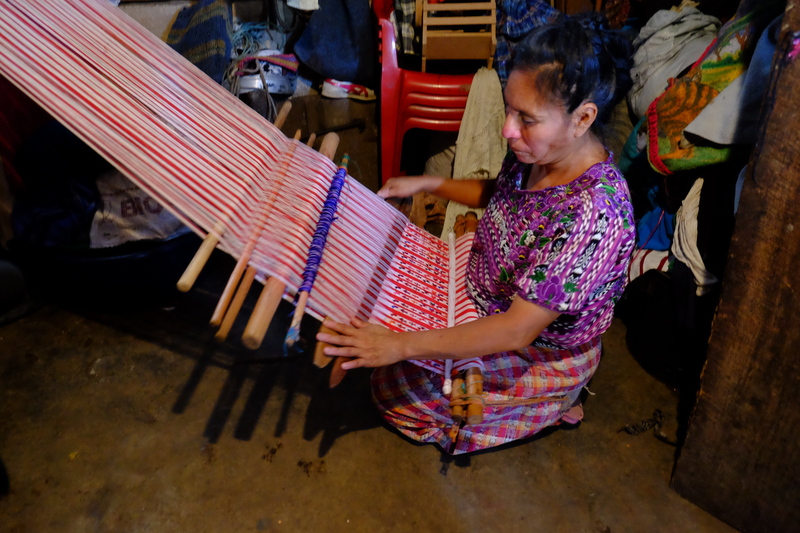 She explained that each Mayan tribe has their own distinct pattern of weaving fabric with specific colors and patterns. This was done traditionally so when the indigenous tribesmen and women went to the coffee and fruit plantations, everyone would recognize which tribe they were from by the pattern of their garments. What did you take away from your experience while working on this project? I felt like I genuinely connected with the people featured in these photographs. They invited me into their lives and allowed themselves to become vulnerable in front of my lens. I am still in contact via Facebook with many of the children from the school, and I enjoy reading their posts and communicating with them. I will carry these stories and faces in my heart for the rest of my life. Well there are so many great photographers, whose work I respect. However, if I had to choose one, it would be Toni Frissell. This is mainly because she was a pioneering female photographer, who mastered an immense repertoire from fashion to photojournalism to war photography and portraiture. She is a wonderful role model, and I believe she would have been a very interesting person to observe at work. Thanks for being our featured photographer for the week, Nadia! For more information about Nadia, visit her website. All images © Nadia Pandolfo.